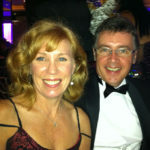 My name is Sandie, I run my own business from home, working as a mortgage broker. Previous to that I worked as a make-up artist for film and television predominately at the ABC in Gore Hill Sydney. I have a wonderful partner Stuart, and two adult children, Harry 29 and Ilsa 28. In March 2016, aged 57, I went to my doctor after experiencing a feeling like a pinched nerve in my abdomen. An x-ray picked up the bottom of my lungs and showed a 2cm lesion on the pleura of my left lung. My doctor wasn’t concerned as I had never smoked or worked in an environment that would have exposed me to any dust diseases, and have always been very fit and healthy. He put the lesion down to old scar tissue from a chest infection but advised another x ray in 3 months just to be safe. In that time, the lesion had grown to 2.2cm and they picked up another 8mm lesion, plus a couple of 1mm spots. I was referred to a respiratory specialist, but my doctor still reassured me that this was most likely nothing as I did not fit any markers for any sort of lung disease. I took a close friend with me to my appointment with a respiratory specialist at Macquarie Medical Centre – I didn’t know how I would react if it was bad news. In my mind I really just thought “this will turn out to be nothing or at least something easily treatable”. They would just cut the lump out, right? After a needle and core biopsy, much to the disbelief of the specialist, it was confirmed I had mesothelioma – I felt numb. I was referred to the Asbestos Disease Research Institute and all the wheels started turning to link me up to the best oncologists, surgeon, nurses and sports physiologist I could have imagined. I had no symptoms at all, was exercising regularly with no breathing difficulty or cough. There was also no history of lung cancer, or any cancers for that matter, in my family that I was aware of. I didn’t tell my partner or children until a few days before I started chemotherapy in September when it was unavoidable. I just didn’t know what to say and wanted to be able to give them good news with the bad – “I have cancer but it’s ok, I’m starting treatment on Monday”. I had no idea that people would make an assumption that I was a smoker so I was quite open at first about having lung cancer. I quickly learnt to add “and I have never smoked” every time I told anyone. Some of the worst experiences were with my extended family that have known me for over 15 years and still said “I didn’t know you smoked” when I told them. After that I became very guarded about who I told – I had no symptoms, no one would know anything was wrong to look at me. Once I explained it was Mesothelioma, asbestos related cancer, people would then ask when I worked in the building industry, so I had to deal with the other misconception that Mesothelioma is a disease that only affects people that work with asbestos. I just happened to be in the wrong place at the wrong time and was exposed to asbestos in a work place over 20 years ago. To be honest it was exhausting trying to pre-empt the stupid and insensitive questions and comments from some people. Until starting chemotherapy, I was unaffected physically by the Mesothelioma. I had five rounds and the first week of each treatment was really tough – nausea, dizziness, tired, constipation, hair becoming brittle and thinning , mouth ulcers. I fell into a rhythm and all the tumours reduced in size and heat measurably so it felt worth it. In March 2017 I had an operation to remove my left lung, pericardium, and left diaphragm, part of a rib and lining of my rib cage. The surgery was followed by 30 rounds of radiation therapy in June. This was by far the worst part to recover from; I nearly gave up on the treatment half way through because of the side effects – vomiting, vertigo, and an 8kg weight loss from my 55kg frame in a month. I’m still recovering from the radiation both physically and emotionally. I see a physiotherapist every fortnight and attend stretching and exercise classes as I get very stiff and sore and have limited flexibility due to the inflammation and scar tissue. I have also had to get assistance from a psychologist due to anxiety and panic attacks I experienced after the treatment. Slowly I am starting to feel more like my old self, or rather a new version of myself. Two CT scans since my radiation therapy came back clear with no recurrence, so that’s all I can hope for. I’ve returned to work and try to do as many of the things I used to as I can. I now walk 5km at a good pace comfortably and am looking forward to planning some trips soon. My surgeon says I am either the unluckiest person in the world or the luckiest, I prefer the latter. I think the stigma attached to lung cancer prevents a lot of people talking about it because we don’t want to expose ourselves to the ignorance and thoughtlessness of some people, but that means we are not getting out there and educating them. That’s why I now want to be an advocate for lung disease patients to break down those stigmas and misconceptions. I believe the community needs to be educated that not all lung diseases are related to smoking or even working in an industry where you are exposed to dust. There also needs to be more funding for new treatments and access to therapies that are available overseas. There are other options for treatment in the US that we don’t have in Australia which would mean far less invasive surgery. These treatments are showing really good outcomes for thoracic mesothelioma in early stages like mine. I think it is wonderful that organisations like Lung Foundation Australia exist. We need as much exposure as possible to the general public about lung diseases and to get as much awareness as possible that this is a major killer and is very under-funded. Medical professionals understand but there is still such a stigma with the public.